So it turns out the world can come together to face a common problem -- except it's in opposition to the reduction of carbon dioxide emissions instead of for it. All the big non-European countries -- the United States, China, Japan, Russia and India -- are signatories to the "Moscow Joint Declaration," which expresses disapproval of EU's plan to charge airlines for the carbon their planes emit flying to Europe. The reduction is quite small -- 0.6% of world emissions -- and the cost works out to $21 per metric ton, or about $2 on a one-way ticket. But even this doesn't seem acceptable, and if this isn't, it's difficult to imagine what will. Here are some of the particulars: the aviation industry emits 3.5% of worldwide CO2, or currently about 1,000 Mt per year. The EU's wants to reduce this by 183 Mt per year in 2020, or 46% for the planes whose landing and take-offs happen in Europe. 183 Mt is really quite small -- it's the emissions of 10.8 million Americans (in 2009). Or 36 million Chinese. By comparison, in 2009 the World emitted 29,000 Mt from fuel consumption. The EU is initially waiving 85% of the fees, but by 2020 it's estimated to cost airlines €2.8 billion ($3.8 billion). But I guess that can be alot to the airline industry, if they can't pass it on for reasons of competition. But it shows how unwilling anyone is -- except the Europeans and (about half of) the Australians -- to charge for carbon emissions. Here's an interesting nugget from the Calgary Herald: "Mountain top coal mining in the U.S. has already disturbed 10 times more surface area than current [Alberta] oilsands development and will mine more area than oilsands developers can ever exploit in the lifetime of the resource. That's not something you often hear from environmentalists. Bill McKibben has written an astonishingly dishonest article for the Huffington Post. Yes, I get it: McKibben thinks he is making hay with the Keystone XL issue -- and he certainly has made some -- and doesn't want to lose that. But that's no reason to fudge the facts. He wrote about last weekend's Swart and Weaver article in Nature Climate Change -- the one that finds the carbon content of the "proven" Alberta tar sands will only raise average global temperatures by 0.03°C -- and he completely avoids mentioning their result. Completely. In fact, much like Joseph Romm, he twists the article into implying it supports his established position -- when it does not. There isn't a single mention of the +0.03°C result in his article. Instead he bypasses it completely and moves beyond to report on the consequences of burning all of it -- which no one is currently talking about -- and of burning all available coal -- which we all accept would be disastrous. A new study from a pair of British Columbia scientists shows that there's a lot of carbon in the tarsands -- but a lot more yet in the planet's coal deposits. If you burned all the tarsands we know about now, you'd raise the planet's temperature more than half a degree -- i.e., half again as much as the global warming we've already seen, which has been enough to make the seas 30% more acid and cut Arctic sea ice 40%. But if you burned all the coal we know about it, the temperature would go up 15 degrees. At a certain point, I suppose, it doesn't matter -- most scientists think anything more than two degrees Celsius puts us into a zone of extreme danger, and we're already halfway there. Fifteen degrees would be just gilding the lily. Still, it makes it clear that even if, as NASA's James Hansen has said, burning the planet's unconventional fuels like tarsands would mean it was "game over the for the climate," stopping that burning won't be enough. We also have to address the most obvious, conventional forms of energy -- coal, especially. It was the first kind of fossil fuel we learned to burn, 300 years ago. And we've got to kick the habit. Do you see any mention of the paper's main result? No, I don't either. Sure, it's easy for McKibben or me or you to say we shouldn't burn all the tar sands or all the coal. But we have very, very good lives and get to fly all over the world to do what we want. Do you think about carbon when you fly? Anywhere? No, neither do I. Once activists get into a cause, you just can't trust them to accurately portray the facts, especially if the facts change against them. I wonder how much funding 350.org gets, anyway. Does anyone know? Have they ever revealed it? As the Heartland Institute documents are now clearly of journalistic and even historical interest, I've started a "Climate Document Storehouse" and uploaded them here. I spoke with American Geophysical Union President Michael McPhaden tonight, who was in Australia. He answered my questions about the Peter Gleick/Heartland Institute incident and Gleick's resignation as Chair of the AGU Task Force on Scientific Integrity. We also discussed its potential impact on AGU, scientists who are also activists and/or concerned citizens, and politicalization in the climate debate, including that of Chris Mooney who was on the Board of Directors of the AGU. As background, see today's AGU statement on the Gleick affair. The full podcast is about 21 minutes long. On Thursday, 16 February, prior to his blog post, Dr. Gleick resigned as chair of AGU’s Task Force on Scientific Ethics, which first convened in November 2011. In his resignation, he cited “personal, private reasons” and expressed concern that he would not be able to fulfill his responsibilities as chair. His resignation was accepted. Following Dr. Gleick’s resignation, a search began immediately for a replacement. Effective today, 21 February, the new chair of AGU’s Task Force on Scientific Integrity is Linda Gundersen, Director, Office of Science Quality and Integrity, USGS (U.S. Geological Survey). The American Geophysical Union is a not-for-profit society of Earth and space scientists with more than 61,000 members in 146 countries. Established in 1919 and headquartered in Washington, D.C., AGU advances the Earth and space sciences through its scholarly publications, meetings, and outreach programs. For more information, visit www.agu.org. These words are from Richard Littlemore at Desmogblog, but I've added the colors. Can someone please explain to me how the sentiment in blue is not in direct opposition to the sentiments in red?? Is a PR agency saying anything if its sentences add up to exactly zero? Peter Gleick's name has been removed from the AGU's site on their Task Force on Scientific Ethics, but no mention from them otherwise. Earlier I asked them for a statement from, or interview with, AGU President Mike McPhaden, and they say they will get back to me. The worst thing about all this is that there are a certain group of people who, if this were a high school debate and you had them reverse all their positions, their tactics and tone would be completely predictable and the tenor of the debate would be completely unchanged. Joe Romm is in that group. But Gleick is right that he committed a serious lapse of professional judgment and ethics. He is right to regret his actions and make a personal apology. before reverting back into his shtick of rage, spending another 1,000 words attacking Andrew Revkin because Revkin wrote this and smeared him and didn't retract that and owes an apology and on and on and on. And when exactly will Revkin apologize for his various lapses, including his absurd and I think hypocritical response to Gleick’s post? Whatever keeps the talk shows calling, I guess, right? Oh yeah: I was wrong when I guessed that Romm would ignore the Swart and Weaver article claiming that the Alberta tar sands will only add +0.03°C to future warming. Romm did mention it -- and calls it confusing, and then turns the tables and claims the paper "makes a strong case against the tar sands if we want to avoid catastrophic warming." That, people, is how this game is be played. Eugenie Scott, NCSE Executive Director: "Gleick obtained and disseminated these documents without the knowledge of anyone here, and we do not condone his doing so.... They show that NCSE was right to broaden its scope to include the teaching of climate science. There really are coordinated attempts to undermine the teaching of climate science, and NCSE is needed to help to thwart them." "It’s unfortunate that the bitter, personal attacks on his colleagues and their work contributed to what he called a lapse of his own personal judgment and ethics." This just isn't a time to for yeah-buts and they-do-it-too's. There just isn't any place for Gleick's illicit actions -- lying, at the least -- in science. And he is still a scientist, even if he is also an activist. This is the same thing that disturbed me about Michael Mann's apparent search for an journalist to "investigate and expose" Steve McIntyre. Science has its ethics, just as golfers are expected to call penalties on themselves even when no one else sees their foul. Gleick did, but only eventually and only when the suspicions grew. It wasn't right in the first place. It certainly undercuts Knoblach's sentence in the same message, that Gleick is "a strong advocate for the important role science plays in society." Maybe I have a rose-colored view of what science is supposed to be. But I do. "The Scientific Ethics Task Force is responsible for reviewing and guiding the Union’s standards, principles, and code of conduct on ethics and integrity in scientific activities." What a tragedy. I thought Steve McIntyre's thoughts tonight were well said: "No one should feel any satisfaction in these events, which have been highly damaging to everyone touched by them, including both Heartland and Gleick." Unfortunately I see a lot of piling on, though unfortunately some of it is not unexpected. Ever classy, Morano puts Gleick's picture and email address on his page -- both of them three times. What a pitiful display by both sides. Just to clarify, I checked with the Pacific Institute, and they say Peter Gleick did not create the document the Heartland Institute says is fake -- that it was the document mailed to him that he mentioned in the 2nd paragraph of his HuffPost piece. Revkin: Gleick's "reputation in tatters...."
Andrew Revkin writes "...Gleick has admitted to an act that leaves his reputation in ruins and threatens to undercut the cause he spent so much time pursuing." Revkin's breaking tweet is here. Peter Gleick admits to illicitedly obtaining the Heartland documents.... and sets environmental activism back 10 years (at least). 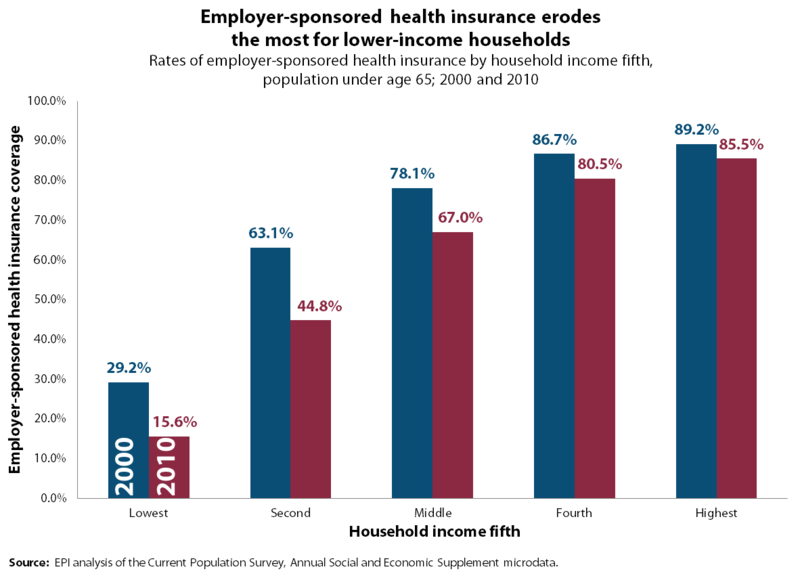 "I was surprised by the results of our analysis.... I thought it was larger than it was." "The conventional and unconventional oil is not the problem with global warming. The problem is coal and unconventional natural gas." "I have always said that the tar sands are a symptom of a very big problem. The problem is dependence on fossil fuels." Is the Pressure Getting to the Heartland Institute? You should be ashamed of yourself. The United States already has a problem in keeping up with the rest of the world in science education and now you want to play a role in further destroying our nation as well as our planet. You are a traitor to your own country. I did not spend 30 years in the military to protect the likes of you. I assume your intemperate comments are based on a forged memo that misrepresents our efforts in the area of global warming research education, so let me explain before demanding an apology. The Heartland Institute has never tried to “dissuade teachers from teaching science, “undermine” any other sources of research, or “keep opposing voices out” of the debate over global warming. In fact, our goals and activities are just the opposite: We have helped thousands of teachers upgrade the ratio of science to rhetoric in their classes on climate change. We have complied two hefty reports – one 800 pages long and another 400 pages long – summarizing peer-reviewed literature on climate change. We have sought to promote debate and a free exchange of ideas, despite efforts by the most alarmist voices in the debate to try to shut down discussion and ruin the reputations of any who doesn’t toe the ideological line of a small but politically powerful faction of the global science community. The forged memo has been quoted in scores of articles and hundreds of blog posts. We are working to get those statements removed and retracted. Meanwhile, and regrettably, many people like you are being misled about our work and intentions. The next reply from Bast wasn't any better -- see Wamsley's site for the full correspondence. Unfortunately this doesn't surprise me, based on stuff I've received from "skeptics" every once in awhile. How about a little grace under pressure? Apparently this email was sent this morning (unless it also is fake). Desmogblog still has the documents up as of 3:18 pm CST. Where Did the Alberta-Catastrophe Linkage Come From? So where do claims of a Alberta tar sands climate catastrophe come from? "The tar sands are estimated (e.g., see IPCC AR4 WG3 report) to contain at least 400 GtC (equivalent to about 200 ppm CO2)." That's a much higher carbon number than Swart and Weaver, which is only 22 GtC for the Alberta tar sands proven reserves and 238 GtC for the whole caboodle. Hansen's number is almost 20 times larger. So where did he get his number? From the IPCC's Third Assessment Report, he wrote. I think he misread that report. 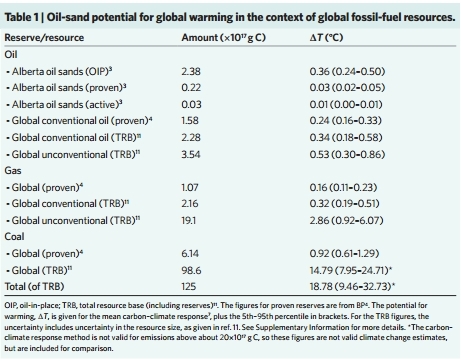 Anyway, Figure SPM.2 of the IPCC 3AR WG3 (pg 6) shows unconventional oil reserves of about 400 GtC. Table 3.28b of the same volume gives a resource base of "Unconventional Oil" of 440 GtC. But that's all unconventional oil, worldwide, including (from the caption for Figure SPM.2) "tar sands, shale oil, and other heavy oil." I'm not an expert on oil, so I'm not sure how much unconventional oil there is besides the Alberta tar sands. Wikipedia says Venezuela has 1.2 trillion barrels (Tb) of the stuff, and that oil shale deposits are an estimated 2.8 - 3.3 Tb of recoverable oil. Again, Alberta has an estimated total of 1.8 Tb. So I think Hansen either misinterpreted the number from the IPCC 3AR, or wasn't clear about what he meant when he wrote "the tar sands...," or Romm/environmentalists didn't take the time to understand his number and mistakenly applied it to the Alberta tar sands. In any case, his carbon number is almost 20 times too big. Of course, people may well exploit the other sources of unconventional oil, too. But that would only add another 0.6°C or so to whatever warming will occur. When is it too much? Beats me. This 2010 TED talk by Richard Sears says the end of the petroleum age is already at hand, and it's coming about by better technologies (and not constraints on energy usage). A paper just out in Nature Climate Change finds that the climate cost of exploiting the Alberta tar sands is very slight: +0.03°C. Neil Swart and Andrew Weaver added up the carbon in the oil sands -- total (1.8 trillion barrels), the economically viable "proven reserves" (170 Bb), and the amount currently under active development (26 Bb). That's less than I calculated last month, but then, I was being somewhat loose with my numbers, and the carbon-climate response I assumed was equivalent to 2°C/TtC. It's difficult to argue that an extra 0.03°C of warming will be catastrophic, whatever future warming is. It won't even be noticeable. 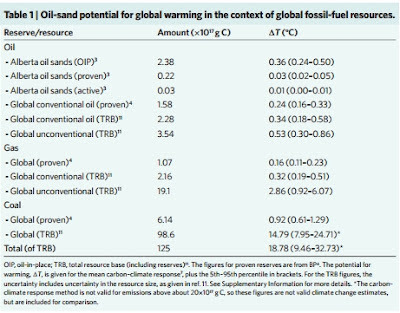 They didn't add any tar sands premium -- extra greenhouse gases from the tar sand-based oil itself, and the extra energy needed to extra the tar sands, compared to conventional oil, which is something like 20% -- that would make the temperature change +0.04°C instead. Meanwhile those proven reserves are worth about $17 trillion at today's prices -- one-fourth of world GDP; ten times Canadian GDP. I don't know how much of this money Canada will actually retain -- a CBC program I watched recently suggested it may be as low as $1/barrel. Still, $170 B is nothing to scoff at. And, of course, the world still runs on oil, and that's simply not going to change anytime soon. Of course, that's the problem with all such considerations as this -- individually any additional carbon emitted looks very small, if not infinitesimal -- but collectively it all adds up, over decades, to an enormous impact. Humans have never been good at dealing with these kind of issues, either in our personal lives (it's only one doughnut) or collectively. So I would say: Joe Nocera beats Joe Romm. PS: Who's betting Romm ignores this paper? Of course, if Gleick were writing about this the HI would accuse him of reacting based on a claimed-to-be fake memo. Isn't Kaminsky's article libelous? Or just super-sleazy? The Heartland Institute's behavior in this has not been very...inspiring. They have clung to the thread of claimed fakery as a way to try to seize the high ground, writing, "Those persons who posted these documents and wrote about them before we had a chance to comment on their authenticity should be ashamed of their deeds, and their bad behavior should be taken into account when judging their credibility now and in the future." But as others have noted, such as Andrew Revkin, they were very quick to condemn scientists after Climategate I. They are pushing the fakery hard as a way, apparently, to draw attention from the other documents. Just as hypocritical was Anthony Watts complaining of Desmogblog's attempt to "demonize skeptics." Of course they are! So is he -- I'm not sure who's better at it, him or them. Talk about the pot calling the kettle a blackbody. America has really adopted the talk radio schtick they've been hearing for the last 25. The climate issue has devolved into the taunting between fans of rival teams, full of Pete's from Albany who never played beyond junior varsity, but who all know exactly how to score from the 40-yard line with 2 minutes left on the clock. Then there's the "funding for sceptics is literally microscopic compared to the massive swill trough available for the consensus" argument. It's not a question of funding consensus views versus 'skeptic' views -- it's funding science versus non-science. OK? You have to love the open letter written to the Heartland Institute by seven of the victims of the Climategate hack. That was very clever on someone's part. There is clearly a concerted effort by a core group to fight back hard. A study by John Christy finds no decline in snowfall in the Sierra Nevada mountains in the last 130 years. RogerPielkeJr: @mtobis @PeterGleick What fuel? I emailed him to ask, seemed like the best course of action, no? Still awaiting his reply. This seems based on nothing except that he's in the Pacific time zone, and vague comparisons about what's written and about writing style. By the way, my position going forward is that I'm going to assume this memo is fake until proven otherwise. It's just too fishy. Brad Johnson of Thinkprogress tells me "the reason we didn't post the IRS doc was that it's too large for our upload tool." (At 2.7 MB it's by far the largest document.) He adds, "Nothing exciting there." A little strange: Brendan DeMelle at Desmogblog posted 9 alleged Heartland Institute documents on his original post, but Richard Littlemore, who posted just one minute later, only posted 8, leaving out the Word document "Minutes of January 17 meeting". And Brad Johnson at Thinkprogress left out the IRS document. Jim Lakely at the Heartland Institute tells me they are "100 percent" sure the climate strategy memo is fake. I used a pdfinfo script to analyse the memos. The info I got is that all the meta data dates changed on the day of the leak in the Pacific time zone (-8 GMT). This is likely where our thief resides. This is also where the “fake” was created on 2/13. The other docs, with the exception of the IRS form were in the central time zone (-6 GMT). The IRS form was -4 GMT. This has been corroborated by a commenter at Lucia’s. Based on this, and I’m not sure if I’ve covered every base, the strategy memo is a fake. The only other option would be if the create dates were faked, highly, highly unlikely or, the sender from HI didn’t have the doc, and someone from the west coast scanned it , emailed to her to send to the leaker. This, to me, doesn’t seem likely either. Logically, I have to go with HI’s story. I'm stumped as to how to prove the provenance of the claimed fake memo with the information that is publically available, and I haven't seen anything that is completely convincing (including Megan McCardle's textual analysis, which has insights, but, as she notes, is not definitive), so I thought I'd put up a timeline in case anyone sees any connections I've missed. I'll update this based on corrections, clarifications, or new information in the comments. All times in Eastern Standard Time, with noted qualifications. 6:03 am Sydney, Australia time(?) - Sydney Morning Herald publishes an article where Robert Carter "did not deny he was being paid by The Heartland Institute, but would not confirm the amount, or if the think tank expected anything in return for its money." I don't have much new information, except the header of the email the leaker sent to Desmogblog, Thinkprogress, etc., after it was forwarded to Keith Kloor. The date and time are from the original email, not that forwarded to Keith. I think Gmail hides IP addresses.... I suppose it's just a coincidence that this email was sent 13 minutes after the hour and Desmogblog's first post on the subject was also 13 minutes after the hour.... Not sure of the time zones involved. Keith Kloor gave an excerpt of the email here. I guess I'm behind on this, because this afternoon Politico reported that Desmogblog received the documents yesterday (2/14) and "The blog posted them about an hour later without contacting the Heartland Institute for confirmation." So they received them after the suspicious memo was scanned (according to its metadata). Which doesn't prove its not fake, but at least the timeline isn't inconsistent. Keith says it was sent yesterday (Feb 14th), which is after the creation date for the "2012 Climate Strategy" memo of "2/13/2012 12:41:52 PM." So, indeed, it's possible the document was first scanned at (or by) the Heartland Institute on 2/13, as per its document properties, and then emailed to the leaker either Monday afternoon or Tuesday morning, who then quickly sent it around. So no clues there. Except, if this is the scenario, I'm surprised at how little time Desmogblog or Thinkprogress Green spent in analyzing and discussing the documents. By the way, Thinkprogress is not hosting the IRS document. Legal concerns, maybe? Here is the metadata from the 9 alleged Heartland Institute documents Desmogblog put up yesterday. The first one is the one the Heartland Institute calls fake, and it clearly stands out from the rest by its creation data -- only two days ago -- and the fact that it's scanned. Desmogblog's first post about these documents was yesterday (2/14) at 14:13. I'm not exactly sure what time zone that is, but this means -- if I'm downloading and interpreting this data correctly -- they posted this document within about 24 hours of it being created. Does that seem likely? Maybe, but I would think they would have first done some vetting and checking and had discussions among themselves and maybe even a lawyer. So I am really wondering if, indeed, this file is fake. And again, why was it scanned if the documents were leaked via email? Why Is Desmog Blog's Document Scanned, Not Digital? Is "Confidential Memo: 2012 Heartland Climate Strategy" a "total fake," as the Heartland Institute claims? I don't know, but here's something curious. 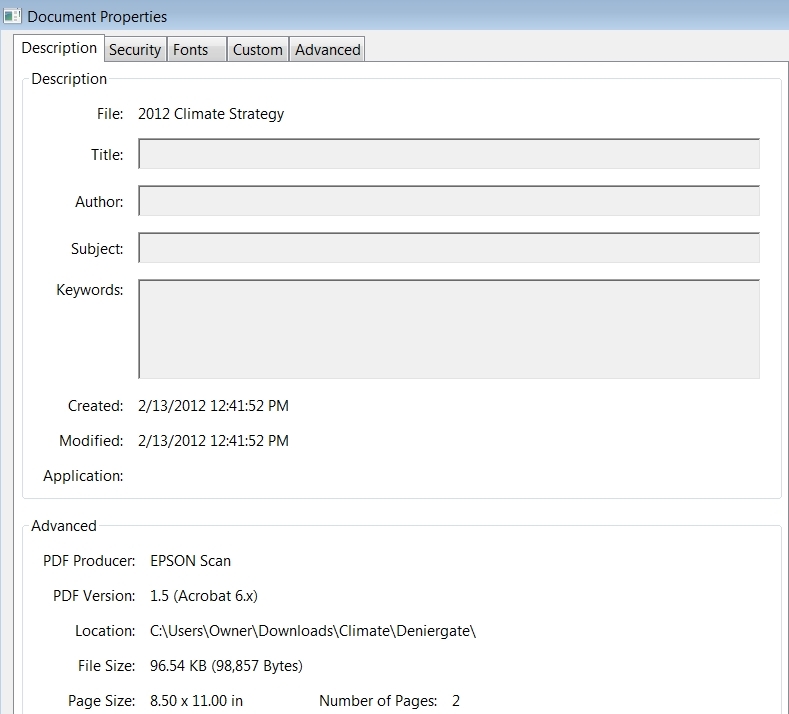 The document hosted by Desmog blog is clearly scanned, and indeed the document's metadata says the PDF Producer was "Epson scan" and it was Created on 2/13/2012 at 12:41:52 pm, as shown at the right. But today Desmog blog wrote, "The Heartland Institute has confirmed in a prepared statement that it mistakenly emailed its board materials to an anonymous third party - confirming the source of the documents released here on the DeSmogBlog yesterday." So if the document was emailed to the leaker, why did someone need to make a scanned copy to give it to Desmog blog? Why didn't they just give them the digital copy? Note: The file location on the metadata is mine, not what came with the document. ''That suggestion is silly and offensive - a kindergarten level argument,'' Professor Carter told the Herald. Climate Depot: "ALERT: Key Heartland document touted by warmists is a FORGERY?! Developing... | Climate Depot"
UPDATE 2/16 3:44 pm - This post is based on information from a document the Heartland Institute says is fake. As Leo Hickman writes at the Guardian, perhaps the most disturbing piece of the Heartland leak is this phrase: "...key points that are effective at dissuading teachers from teaching science." Right there you have the true goal of it all: Dissuading the teaching of science. Deniergate is simply another chapter in the half a millenia-long war against knowledge that started against Copernicus. It never ends, not really. Principals and teachers are heavily biased toward the alarmist perspective. To counter this we are considering launching an effort to develop alternative materials for K-12 classrooms. We are pursuing a proposal from Dr. David Wojick to produce a global warming curriculum for K-12 schools. Dr. Wojick is a consultant with the Office of Scientific and Technical Information at thevU.S. Department of Energy in the area of information and communication science. His effort will focus on providing curriculum that shows that the topic of climate change is controversial and uncertain - two key points that are effective at dissuading teachers from teaching science. We tentatively plan to pay Dr. Wojick $100,000 for 20 modules in 2012, with funding pledged byvthe Anonymous Donor. I guess now we really know why Fred Singer "Remains a Global Warming Skeptic," huh? $139,200 a year for Craig Idso! $60,000 a year for Fred Singer, plus expenses! It's really time for the editors everywhere who publish op-eds, like the WSJ and The Australian, to start disclosing funding sources. Completely. Always. Every time. For any op-eds, anywhere, of whatever view. Too many people are for sale. UPDATE: Not to mention Joseph Bast, the President of the Heartland Institute, who made $145,135 in 2010. UPDATE 2/16 3:44 pm - This post is partly based on information from a document the Heartland Institute says is fake. Anthony Watt$ say$ he needed $90,000...to make $ome graph$. "for funding a special project having to do with presenting some new NOAA surface data in a public friendly graphical form, something NOAA themselves is not doing, but should be. I approached them in the fall of 2011 asking for help, on this project not the other way around." Update: Watt$ $ay$ only $44K ha$ been pledged $o far. Apparently time$ are tight even for denier$. Kaustabh at Paleowave catches Fred Singer in yet another fabrication: a claim that proxies show no warming since 1940. Kaustabh debunks this nicely with a long list of just a few of the proxy studies that do show warming -- and notes that his very own PhD research on marine sediments show a large 20th-century warming signal. However, Charles Jackson, a research scientist for the Institute of Geophysics and part of the UT faculty at the Jackson school of Geosciences, says that much of the evidence Singer refers to is less of an alternative opinion and more bad science. Contrary to Singer’s view, Jackson said that the planet is warming and that the rate of effects like sea ice melting and sea level rising are consistent with CO2 being the causative agent. “We know the rate of effects of the greenhouse gasses, so if we didn’t see a warming we would be wondering why, “ said Jackson. “...It would be astonishing not to see it." Of course, this is hardly the first time Singer has presented fictional science (see here, here, and here, and expand outward), but it should be the last. "It's of no use whatsoever[...] this is just an experiment that proves Maestro Maxwell was right -- we just have these mysterious electromagnetic waves that we cannot see with the naked eye. But they are there." Hertz died at age 36. Here is a great piece of data presentation of the Keeling Curve, via the blog Paleowave. I've taken the liberty of making it a larger (and expandable) size, which loses some resolution, but not much. "Valentine's Day destroyed by climate change?" "I would argue that the real story of the universe is far more interesting than any myths or fairy tales that people wrote thousands of years before they even knew the Earth went around the sun." "I think the great wonder of science is that our faith is shakeable, not unshakeable." He has a great way of riffing on science and expanding his thoughts to the largest questions. The whole podcast is definitely worth listening to. Here's an interesting thought from Ken Caldiera (Stanford) on the Google geoengineering list. It's in response to Alan Robock (Rutgers), who wrote about his discussion with some protesters who believe "chemtrails" are a secret spraying program. (Debunk here.) Robock's discussion was posted to YouTube, and he got an inflammatory email from a viewer -- also posted on the thread. Caldiera's comment is applicable to the larger climate debate and its stand-in as a proxy for other issues, as Mike Hulme writes. "I think it is not helpful to think of them as "enemies". I see these people as victims of past government lies and, in many cases, their own mental instability. "These people have been living under a government that has started secret wars, has secretly kidnapped and tortured people, and so on. They have lived under a government that has lied to them repeatedly. "These people have no technical background to distinguish ordinary jet contrails from paranoiac visions of massive government conspiracies. They see jet trails becoming more numerous over the decades and are too innumerate to associate this increase with increase in jet travel. "I prefer to see these ChemTrails folks as victims, both of past government lies and, in many cases I suspect, of some degree of mental illness. So, let's not look at them as "enemies", but as people who need help." You never need an excuse to post a good chart, and the Guardian has one on the area of GM crops in 2011, in hectares. (1 ha = 10,000 m2 = 2.47 acres.) About 50% of all GM crops are now grown in developing countries -- 15 years ago GM crops only composed 1.7 million hectares worldwide. Are GM crops a problem? I've never been able to find a problem from eating them, though I'm not convinced they're not, in part, a strategy of Big Biotech to corner the market. They may not be a containable as the industry promised, but their use is now inevitable, though some activists continue to fight them. Americans don't seem to have a clue either way. The ISAAA (who are supreme cheerleaders for biotech crops, so skepticism is warranted) says biotech crops saved 1.7 billion kg of CO2 in 2010 due to decreased use of fossil fuels, equivalent to 800,000 cars. That sounds impressive, but it's only 1.7 million metric tons of CO2 in a world that now emits about 29,000 Mt CO2 every year from fossil fuel consumption -- so it's only 0.007%. 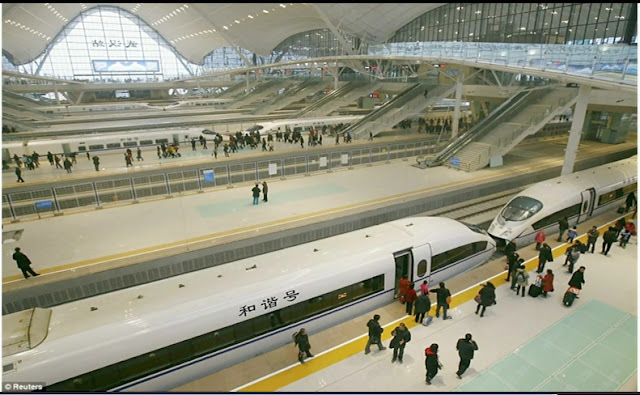 Speaking of China, here's a great TED talk by Martin Jacques on the subject about how China is going to be changing the world in the next few decades. Full of ideas that will make you think. From 20100. (Be sure to see the ship at 20:39.) One picture in particular struck me -- it's of the Wuhan Railway Station for high-speed rail. Does it look like it's even in the same galaxy as the United States? A Gallup poll finds that Americans view China, rather than their own country, as the world's leading economic power today, by 53% to 33% margin -- the same as last year's result. Gallup also finds Americans also generally believe China will be the leading economic power in 20 years. In 2000, Americans overwhelmingly believed the U.S. was the leading economic power.... Then George W. Hoover became President. Though he did what those who purchased him wanted, his complete absence on today's issues indicates even he might have a sense of shame. Americans know that trends like these are degrading our society. As Seinfeld said in The Bizarro Jerry, "The whole system is breaking down!" "We stock thousands of facts for home use." What Is the Texas Drought Telling Us? So the other day I guessed that the cost of the Texas drought was ~ $5 billion for 2011 (though I didn't add up the cost of the fires.) And I wondered if droughts might be the most expensive natural disasters in the disaster spectrum. But John Fleck has been wondering about the opposite -- whether even this drought is a relative blip in the larger forces the buffet an economy. and finds that Texas looks pretty good by this measure. 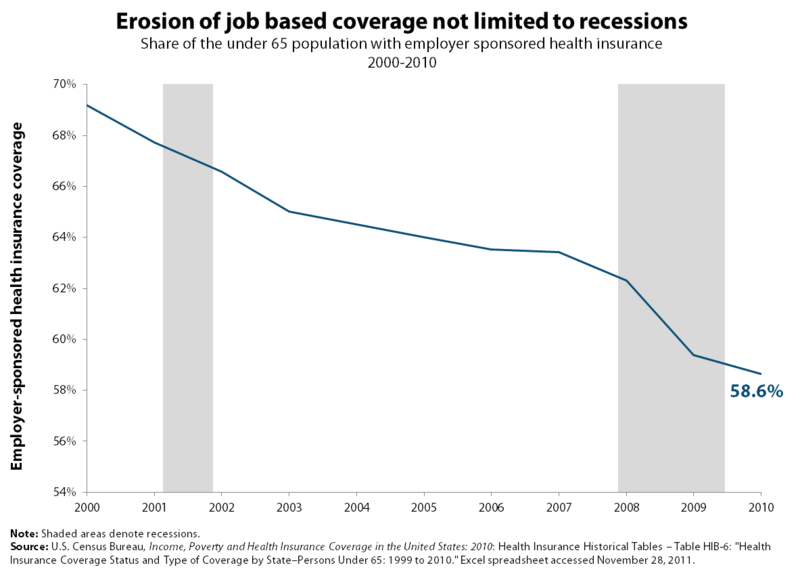 You can't even see the effects of the drought there -- though the fact that it excludes nonfarm payrolls might matter a little. The Texas GDP is $1.207 T (2010), and $5 B (if that's accurate) would be 0.4% -- a setback to an economy, but certainly not a shock. For people like me who spend our time running around with our hair on fire trying to warn the public of America’s looming water shortages, Texas seems to me like an incredibly important case study about what happens when shortage finally arrives. So what’s it telling us? You have to sign up beforehand.... I'm not really sure what level it will be, though. I just finished writing an article about deep Earth geophysics (it will be out next month), which was a subject I didn't know alot about going in. But I found there has been a great deal of really interesting science going on in that field, so now I'm ready to learn more geology. This is the best part about being a science writer -- getting to take crash courses in a different field every month -- sometimes every day -- and getting to talk to the people doing today's research. It suits me perfectly. Bjorn Lomborg's suggestion that we look for adaptive steps to deal with environmental changes is common sense, whether or not man's activities cause these observed changes ("Global Warming and Adaptability," op-ed, Dec. 12). The real problem is the science, or lack of quality science, regardless of which side of the debate about the cause we find ourselves. This is because the warming problem drives us to find solutions to a cause that is not yet scientifically proven. Prof. Lomborg makes the statement, Do we "help the developing world by making drastic carbon cuts?" By saying that, he seems to be suggesting that humans are the cause of global warming. He might contact Prof. Henrik Svensmark, who is nearby at the Danish National Space Institute in Copenhagen, for other causes of climate changes. 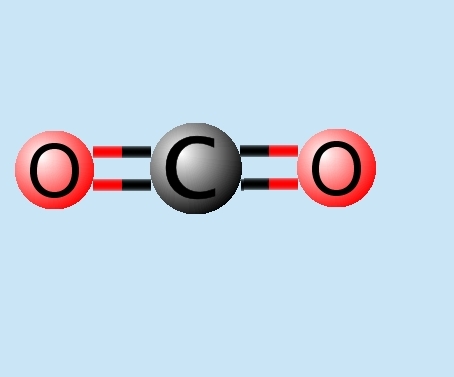 (2) CO2 doesn't absorb heat from the Sun, but from the Earth's surface. (3) Svenmark's hypothesis isn't that sunspots directly control the Earth's cloud cover, but that their influence on the Sun's magnetic field affects the Earth's incoming flux of cosmic rays that, in turn, influence aerosol production and hence cloud formation. This result leaves open the possibility that cosmic rays could also influence climate. However, it is premature to conclude that cosmic rays have a significant influence on climate until the additional nucleating vapours have been identified, their ion enhancement measured, and the ultimate effects on clouds have been confirmed. Anyway, you just can't trust the WSJ when it comes to climate. Or, clearly, Doug Chapman of North Tustin, California. "We will often lapse into using mb as units of pressure, because the unit sounds comfortable to atmospheric scientists. For calculations, though, it is important to convert millibars to pascals. This is easy, because 1 mb = 100 Pa. Hence, we should all learn to say 'hectopascal' in place of 'millibar.' It may take some time." There is actually a lot of humor in this book (in the dry sense). But I wouldn't buy it for the humor if you're not also very interested in the science. Has The Current La Nina Peaked? The current La Nina isn't looking very impressive, and might already be withering. Here are the 30-day and 90-day averages of the Southern Oscillation Index (SOI) -- the SOI is based on the pressure differences between Tahiti and Darwin, Australia, and is a proxy for ENSOs (though perhaps not as good a proxy as the MEI -- Multivariate ENSO Index). So the days of having to explain to people that ENSOs cause fluctuations in sea-level and surface warming may be coming to an end -- though there is still the PDO and NAO to consider. It's always something, isn't it? How much has the drought cost Texas? OK, of course no one really knows how much of the drought in Texas is due to climate change. John Nielsen-Gammon, the Texas state climatologist, has thought an awful lot about it lot about it, and he has his suspicions. That said, the annual harvest numbers (via Early Warning) for several major crops in Texas have been released. The major drought there has had a big impact -- cotton and corn production are both down 55%, and likewise for some others. What does this amount to in dollars? About $4 billion, I think (with the proviso that I don't know much about these kind of calculations). I put a spreadsheet here with links to my sources. That seems in the ballpark -- this article puts numbers in this range for filings of crop insurance indemnities for Texas and other nearby states. This says $5.2 billion, and that didn't even include the entire harvest. And surely ranchers and others have lost a lot too. Plus the fires: about 4 million acres, almost 3,000 homes, and almost 3,000 other structures. It seems that the cost of droughts could easily be greater than the annual cost of all hurricanes. I wonder how they all add-up and average-out over the long-term. "Most controversial is the evolutionary question. I have done a great deal of work on Darwin and can say with some assurance that Darwin did not derive his theory from nature but rather superimposed a certain philosophical world-view on nature and then spent 20 years trying to gather the facts to make it stick." If you don't know, Velikovsky was a whack job psychiatrist and best-selling writer with some...shall we say, unusual...ideas about global catastrophes and the solar system. If he were alive today he would be a shoo-in for a Bloggie in the category of Best Science or Technology Weblog.